Offering an alluring alternative to this traditional "gray infrastructure," green infrastructure handles rainfall runoff through vegetated buffer strips around surface water, forested habitat corridors and regenerated wetlands, among other options. But how do we pay for it? We think that this type of program offers a viable way to stimulate green infrastructure in communities large and small across the U.S. To test that assumption, let's look at how stormwater retention credits might work in a typical small town – in this case, Stillwater, Minnesota. Like many American communities, Stillwater has a relatively small urban core oriented toward a river. It has commercial development along major highways and a ring of sprawling low-density suburban development surrounded by agricultural land. The greatest amount of Stillwater's impervious surfaces are in commercial areas, the downtown district, industrial zones and road and highway right-of-ways. Minnesota's legislature has had heated debates over a bill, signed into law in 2015 and twice amended since then, that requires the installation of landscape buffer strips around major bodies of water. This law has pitted environmentalists against farmers. Environmentalists want to protect water quality in the state, while farmers argue that the law puts an undue burden on them by taking land out of production with no compensation. For purposes of this study, we focused just on a commercial area at the edge of town, with several large "big-box" stores facing a highway. 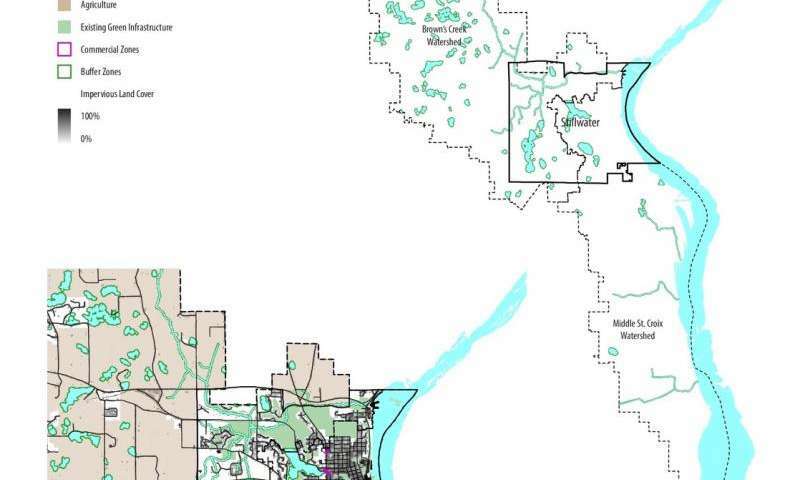 In Stillwater, that commercial area covers 237 acres, 64 percent of which is impervious. That translates to approximately five million gallons of stormwater runoff during a 1.1-inch stormwater event. Such an event has a 90 percent likelihood of occurring in any given year in a state like Minnesota. Green infrastructure offers an economically viable, politically equitable and environmentally responsible way of dealing with our nation's landscape. A stormwater retention credit trading program represents a cost-effective solution to dealing with America's aging infrastructure. It protects local watersheds, lowers costs for urban and suburban property owners, and increases payments to farmers, while protecting our waterways and providing habitat corridors for other species. That's a win-win-win for everyone involved. If widely adopted, such a program could transform the way in which we think of infrastructure and make our nation's infrastructure investment go much farther by utilizing the marketplace to expand its impact and reach.